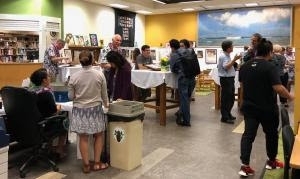 (Hawaii)– News happenings and aesthetics have whimsically merged at the William S. Richardson School of Law library’s third annual art show, “Currents,” featuring 26 artists offering 46 works. The exhibit, on display during library hours through May 13, is an eclectic mixture of photographs, paintings, drawings, fibers, woodblocks, collages and even a psychedelic work evoking the 1960s by artist Blaise Domino, who began his career more than 50 years ago. Many other pieces include artistic commentary on current events. The exhibit was organized by Brian Huffman, electronic services librarian, with assistance from the library’s faculty and staff. See the full story on the School of Law website. Registration is Open for HTY Summer Programs and Introducing T.A.Co. !